A dark sky can be a dramatic backdrop for photographs, but hail is hard on horses, people and rental cars. 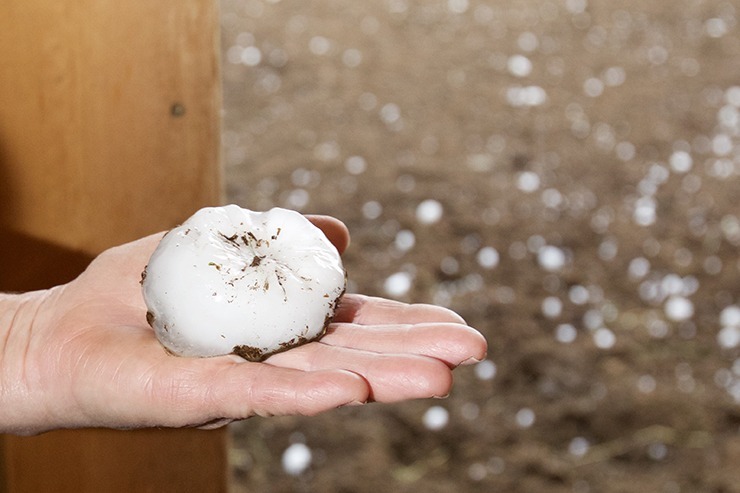 In less than 15 minutes the ground was covered with palm-sized hail. I could see the dark clouds swirling in the sky as I was driving along I-94 in eastern Montana, but I wasn’t overly concerned because the stormy sky would be a perfect backdrop for a portrait I was about to take. I was on my way to Glendive to interview and photograph retired brand inspector and longtime rancher and pick-up man Bill Blankenship for an upcoming installment of the magazine’s Classic Cowboys department. All I needed was one portrait for the story, and I thought surely there was enough time before the storm hit. Boy, was I wrong. When I arrived at the Blankenship’s ranch, Bill and his wife Kitty greeted me and we headed straight to the barn so he could saddle his horse while I scouted a good location for the photo. The wind had picked up and it was starting to sprinkle, so we trailered the horse to the location I’d chosen in the pasture against a sandstone bluff. Bill Blakenship, a rancher, pick-up man and retired brand inspector, patiently posed for a portrait seconds before a huge hail storm put a damper on our photo shoot. About 10 frames into the photo-shoot palm-sized hail started pelting us from all angles. Kitty and I grabbed my camera equipment and ran for the truck, while Bill loaded up his horse in the trailer and then dove into the driver’s seat. There was silence for a moment while we sat in awe and caught our breaths. The sound of the hail hitting the truck was akin to gunshots, and we flinched each time it pounded a window. It even cracked the windshield. When we arrived back at the barn, Bill looked over his truck and trailer and other trailers parked there. They were all dented, and two windows in his house were shattered. “You better see how that rental car faired in the storm,” he advised with a laugh after seeing the small Toyota Yaris I was driving. As with the other vehicles, the Yaris was dented from top to bottom and on all sides. A piece of hail had hit the windshield in just the right spot to shatter a portion of it, leaving shards of class on the seats and dash. The storm caused about $5,000 damage to my rental car, but that was nothing compared to the millions of dollars lost in damaged crops and equipment. It was apparent I wasn’t leaving Glendive in the storm for fear of the windshield shattering completely, so the Blankenships invited me inside for dinner and we chatted late into the night. I didn’t mind one bit, because despite the severe weather I was still able to capture my story and even get the portrait I wanted. The next day I awoke to sunshine, and learned that the storm was 200 miles long and became a rotating super cell over Glendive. I was able to drive the vehicle to Billings and get an upgraded replacement and continue my story-gathering trip. But I had a couple of bruises on my arm for a couple of days from being spanked by hail while shielding my camera.